Warming up is an essential part of getting ready before a game, so that the goalkeeper is prepared to deal with whatever the opposition throws at them. Without it, the goalkeeper would basically go into the game ‘cold’ without having done any preparation (making it easier to get injured). It would be like sitting an exam without having done any revision – you can’t expect to do well! By warming up, you make sure that your body is efficiently warmed up and you are mentally ready to stop shots, having just stopped some practise shots (in real life, it is harder to simply start stopping shots immediately after the game has started because you are not ready). Top level goalkeepers are fortunate enough to have goalkeeper specific coaches who know how to work their goalkeepers properly. If you get to watch the pre-match practise before EHL games or international matches, you’ll be lucky enough to see the ‘professional’ and proper way of doing it; focusing on getting the goalkeeper ready for the game by building up the level of focus. Warming up is all about reaching the optimum level; peaking in time for the match, so that you are at your most alert and during the game. Obviously it’s not a perfect world and not all of us are blessed with an understanding team or coach who will give us a proper warm-up. Warm-ups in some teams normally constitute players just smashing the ball at you for a bit before the game starts! This is not the best way to prepare for a game, but can be resolved if you apply a proper approach and talk to your team mates about the importance of it. Sometimes teams can be a bit lax on giving their goalkeeper a good warm-up, but being the most important member of the team (they can’t win without you! ), you should be able to bargain yourself a deal. In order to get the best out of a warm-up and the time you have before the match, you need to communicate with your team about your needs. A chat to the captain to sort out arrangements will help things along. Having someone that is free to work with you is important, so try and find a member of the team who’d be happy to warm you up. It is also important to warm up before training. The saying goes that . In order to make the most of training, you need to have had a good warm up to be able to put up a good percentage of shot stopping. Whilst the players are warming up before drills, you can take a player aside to get them to take shots at you. It might be possible to work with other goalkeepers; that way you can do more specific practise, like kicking to each other. If you watch international matches you will also notice that the goalkeepers will often warm up at half time, or just before the restart. Goalkeepers, like players, need to be warmed up to achieve peak performance. In the recent Champions Trophy games, I saw Korea’s goalkeeper warming up between halves to prepare for the second half. If you can, it is a good idea to get warm for the second half of the game; prepared to be in the action as soon as a shot comes your way. Unfortunately sometimes your team isn’t kind enough to let you get a good warm up before they start drilling shots at you. If this is the case, then you will have to make do with warming up on your own. On the other hand, if you have kitted up and have some time to yourself between taking shots in the team warm-up, then you can use it wisely. Having a set routine is important to helping you warm up your body and mind. No matter the pitch or conditions (obviously playing away from home you will come across different pitch conditions), your routine will be the same and help you find a comfortable centre to help you relax. Before you do the warm up, it is a good idea to go on a jog. This will help warm your muscles and increase blood flow. It is a good idea to start your warm up early, so you have enough time to be , before the team want to start taking shots at you in their drills. You therefore need to get there earlier than the team, or at least be ready early (when the team goes off on a jog to warm themselves up). 10-15 minutes is a good length of time to give you enough time to pad up and warm up. The work out of taking shots needs to be progressive; starting off slowly and building up ball speed and power progressively. Distance affects your ability to react and stop a shot (the further away it is, the more time you have to react), so by starting with shots from a distance you can start out easily. You can then decrease the distance, having the shooter taking shots at least five feet away and reducing the distance again so that you have less time to react to the shot and work on quickening your reflexes. Some teams normally have goalkeepers warm up away from the team in the corner/side of the pitch, as they jog and do basic stick work. Otherwise, if the goal is free, then you can go in the goal and practise from there; making it easier to focus on goals and prioritise . When taking warm-up shots to get your muscles working and blood flowing, you should start low. 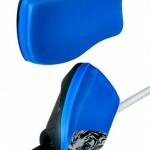 This allows you to get your body moving; stepping onto the angle and pushing into the save. As well as working on your angles and reaching out with your foot to block, it is also working on your footwork; getting you to work on moving across to get on the angle. Try to get equal shots to each side so that you work on equally practising possibilities of real in-game shots. Taking shots to the corners is a good way of making yourself extend into the shot; forcing you to stretch out and try to reach the ball. 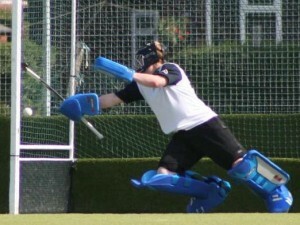 By being having to extend into the save, you are stretching your muscles, which can become torn when making athletic saves to stretch across; if you end up facing few shots in the game. If the goalkeeper is warming up inside the goal, then the shooter should target the corners. If they are warming up outside the goal, then shots wide and outside their body will do the trick. It is a good idea to work on raised shots as well. Again, start slow and then build up speed and power. To get a better work out, ask the shooter to get as high as reasonably possible, so you have to reach and/or jump up to block a lob. Having shots wide of you will also force you to stretch to reach the ball and even possibly high dive in to reach; forcing you to be active in your save making (i.e. as you may face such a shot on short corner drag flicks). Try to work each side, working your right hand as well as your glove to practise shot blocking with your RHP. Have a good warm up! Ultimately, a key part of game success is having a good warm up; building up to the optimum level and then maintaining it throughout the match. By warming up in this way, it helps you find a comfort zone and ease the pressure of facing a shot from the get go. Having warmed up properly, if you were to face a shot within the first few minutes of the match, it would not come as much of a shock because you had already practised and faced some similar shots beforehand. Penalty flicks are dangerous territory for goalkeepers. Going up against a deadly shooter who , the goalkeeper often doesn’t stand much of a chance in stopping the ball. However, they are more likely to allow a goal if they commit and end up getting wrong footed; going the wrong way to where the ball is headed. Instead, by reacting, the goalkeeper has an increased chance of stopping the ball; moving in the flick’s direction to cover the shot. Committing on the flick is essentially making up your decision of where you will go (i.e. left or right) and going that way as soon as the flick has been taken, even if they end up getting beaten. The goalkeeper makes the choice about where they will go and sticks to it; paying little attention to where the shooter is actually shooting at. This may be down to watching the flick taker’s eyes or body position, in an attempt to go the way they appear to be shooting at. If you watch soccer (football), then you will notice that it is a technique often used in penalty shoot-outs: the goalkeepers will usually try to commit to the shooter’s strong side, or usual shot placement, so that they can try to block the shot they think they will be facing. By committing, the goalkeeper stands a greater chance of misplaying the flick. Reacting is the opposite of committing: instead of choosing where they will go, the goalkeeper waits for the flick to be taken and then moves in relation to where the ball is headed. By doing so, they have a better chance of making the save; going the right way to be able to block the incoming ball. In this way, the goalkeeper increases their chances of save making. Even if they get beaten marginally, they have still gone the right way and done their best, which is all that can be asked of them. Notice how this goalkeeper has stayed up and waited for the flick before reacting to it. There are a number of reasons why reacting is better than committing to the flick. At the higher levels of play, flick takers can fool the goalkeeper by pretending to shoot in a certain way; making a deft move by looking one way and going the other. Another way is to position the body so as if to be shooting a certain way, but then turn and go the other. By doing this, the shooter is able to outwit the goalkeeper and send them the wrong way. However, by not committing to the pretend shot, the goalkeeper is able to gain an advantage; not being tricked and being able to go the correct way to meet the shot. You may also be playing against a regular opponent, but even if you play the opposition regularly (which helps you in knowing what are the shooter’s preferences), they may choose a different flick taker; reacting counteracts the problem of working out where the flick taker will go. Studies have also proven that a goalkeeper is more successful if they react. Although it doesn’t sound like much, you are 27% more likely to have success stopping the ball when standing and then reacting, than you are picking your way. In order to have a chance of stopping the flick, you need to track the ball. When watching the flick through to going the correct way, or making the save, you need to focus on the ball from the point it is at the base of the shooter’s stick, through to facing the shot. Focus intently on the ball, trying to maintain your concentration on the shot so you stand the best chance of getting behind it. See how this goalkeeper has followed the ball to its destination; able to track it into the save attempt. Ultimately, you should react to the flick rather than trying to guess and wrongly commit where you would end up putting yourself out of the play. You don’t want to go the wrong way or be made to look stupid, so make sure you wait to see where the ball is headed and move with it. Do your best to react to the flick, than guessing and committing to a shot that doesn’t go where you wanted it to. Author Dan PilgrimPosted on February 13, 2010 Categories Set plays5 Comments on P-flicks: commit or react? When faced with a pass, the opposition is looking to shoot around you; moving the ball to expose and opening up gaps in the goal to shoot into. This is difficult for the goalkeeper, as they have to immediately change direction and try to get across as quickly as possible to make the save on the scoring opportunity. By playing deeper, you can cut off the intended shot; reducing the space and making it easier it get across in time to block, with less ground to cover. In effect, the back door is the space left open by the goalkeeper as they challenge the initial shot; an outlet pass will leave the goalkeeper vulnerable to the space left open on the angle they have set up to make the save. By dragging you out of position, the opposition stand a chance of beating you easily, getting you to challenge too far out, and then ‘hanging you out to dry’, with a pass-shoot transition. An aggressive goalkeeper who likes to challenge the angles is especially vulnerable to the back door pass, where a pass across the face of the goal would leave him open to the space on the side, left because of his aggressive positioning. By staying back against the play, as a lot of reflexive and reactive goalkeepers do, it is easier to react to the back door pass, diving across to make the stop. The best way to react is to stay deeper in the net than normal, making it easier to react to the shot as it is fired, rather than trying to challenge the initial shot, which will leave you open to the pass and back door goal. By staying deeper and moving with the play and using reflexes, or diving across, you stand a greater chance of making the save. Let them do the work; don’t fall into their hands as they try to score on you. Playing on the back line is a technique you will see top level goalkeepers using regularly (and something soccer goalkeepers also do); they are more passive and reflex styled to deal with a shot rather than trying to close down or tackle the ball carrier. Staying back against the shot, and deep within their box, they are more able to deal with a passed shot; able to reach across on the save, rather than get caught leaving open space by challenging the angle too far against the player with the ball. When staying deep within your goal, you can either stay just off the goal line (where you can then run along the line to cover space), or use a much smaller ‘D within the D’; moving around a semi-circle reduced to meet the incoming shot off the pass. With less distance to move to meet the shot, it also gives you a greater chance of making the save, as you have less to do to react; giving you more advantage. If the shot is straight off the pass, like a slap hit, then you have less time to react. As the pass is made, you can react to the play, moving across to cover the available space and get set for a save. You should be able to follow the direction of the ball; cutting across by running horizontally, or going diagonally in order to challenge the shooter’s angle and cut down the available shooting space to limit their chances. A good shuffle across laterally should bring you into the ball’s path; moving along the goal line ready to block. The way you make the save depends on the type of shot you face. If you can, standing allows you to cover both high and low, filling up a lot of goal; if you do try to extend with your leg/arm to reach into the save. However, you may have jump or reach out for the save if you have little time to meet the ball. Diving will help you get more reach on the save, especially if the shot is low; pushing out in full extension to meet the ball on the shot, but be ready to get back up again immediately afterwards for further shots. For a shot to be a goal it needs to be scored within the D. If a shot is taken from outside the D and no-one touches it within the D, then it won’t count as a goal. By leaving it, you will give your team a 16 and the chance to restart play to their advantage. When a shot is taken outside the D and it is not touched by anyone within the D, then your team will get to restart play with a 16 (free hit from the 25). For example, a failed pass that has gone through your defence with no-one on the opposition to get on the end of it, or if and your defence has chosen to leave it (so that it can go off the pitch for a free hit). Instead of kicking it away, straight back into play, you can essentially ‘leave it’ to give your team a sixteen; the rules of the game mean that your team will restart the play after the ball has gone off the pitch. Instead of stopping balls that make there way through the D without an opposition player touching the ball, you can leave it for a 16. The rules state that if an opposition player does not touch the ball inside the D, there is no connection, meaning that your team gets a free hit. Shots outside the D don’t count as goals. It is therefore a good idea to take advantage of this, to give you team control of the play; restarting play from a free hit. Learning to leave the ball in this way will benefit your team by giving them the chance to start breakouts, instead of giving the other team a chance to score from your mistakes. If a shot taken outside the D is untouched and does not get redirected within the D, then, your team will be able to restart the play from the sixteen. A sixteen will be given, so you can let the ball hit the backboard, with your team gaining a free hit. Therefore, if a shot is taken and there are no opposition players within the D with a chance of touching the ball, you can happily leave it and let it go off the pitch. Remember: any shots outside the D aren’t goals, so leave it for a 16! You need to track the ball all the way through until it is off the pitch; just like you watch and follow a shot into the save. In case you are not paying full attention and another player moves into the D when you weren’t looking, it is a good idea to keep an eye on the ball to make sure nothing goes wrong. Watch the ball’s path; tracking the ball to see if any other opposition player gets on the end of it, just in case, and also to ensure that it goes safely off the pitch without getting touched. 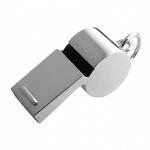 Afterwards, go and collect the ball to give to your defender to restart the play from the sixteen. In order to successfully play the situation to make sure the ball goes off for a sixteen, you need to move out of its way. As you get more experienced and improve your technique, you can soon pick up the ability to ‘dummy’ any players by pretending to kick it; stepping out to “meet” the ball, before dodging its path, before letting it roll off the pitch, or into goal, without touching it. This way you fool the player and make sure it goes off at the same time. If you do touch the ball, accidentally, then you need to kick it away, as the sixteen will no longer count because you (a player) have touched it. There is always a danger that the ball could hit the post and go back into play. By turning round, you can check that the ball does not hit the post and ‘stays safe’; ending up hitting the backboard. If it did hit the post, then you can easily get behind the ball to kick it away from danger, so that an attacking player can’t get to it. Act instantly and rush to get behind the ball (to block if needs be), or kick it away as far as possible to a safe area. If in doubt, kick it out! There is still often the chance of a player running into the D and getting on the end of the pass to redirect it. If they get a touch on the ball, even the slimmest, and it goes past you, then it will still count as a goal. If you are worried about a goal being scored and can’t tell if , then you can follow the maxim of “kicking it out if in doubt”. 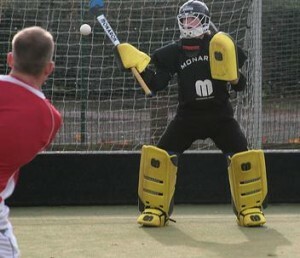 If a deflection does occur then make sure you close off holes in your stance (i.e. bringing your legs together and bringing your gloves in to help cover) to block the ball. If you have ever seen a goalkeeper running out in the attempt to get in front of a shot, only to miss the ball and end up allowing a goal, then you will have seen first hand the inability to save on the move; it’s simply just not possible to move a limb to block whilst moving at the same time. In contrast, if you stop moving, you will be able to make a balanced save (whereas running would throw you off balance). By limiting your movement (which often involves playing deep within the D and close to the goal line; cutting down the distance you have to move), you are able to get behind the angle and therefore stop the shot successfully. Obviously, though, whenever a breakdown occurs in the defence and the goalkeeper is forced into moving out to challenge and cover space, then you will need to move across. If you are moving with the play, there is very little likelihood that you will actually be able to make the save. Racing out to instantly cut the angles and pressure the shooter, you will normally end up losing balance within your ready stance. Unable to stop within the stance and properly move your legs in order to block the incoming shot, your forward momentum will carry you away from ball and the result will be an allowed goal. Staying up is more advantageous as you cover more of the goal, so you need to find a way to cut down the movement you have to make to get behind the shot. Effectively, the only time you would purposefully choose to make an active save on the move, is when opting to slide out against the play to block; choosing to play the percentages and cover as much as possible against the shot. Whereas normally you would have no chance of blocking on the move; like moving across laterally against a passing play, which you cannot stop upright as you simply cannot move with the play in time, trying to save with a piece of equipment; forcing you to leave your feet and dive into the save. These problems essentially mean that a successful save is impossible: the chances are in favour of the ball ending up in the goal because of loss of balance and moving away from the shot. In order to get set in a balanced ready stance on the angle in time, you need to consciously get yourself prepared; getting into position before the shot. Setting before the shot, rather than setting on the shot, or trying to attempt a save whilst still on the move, allows you to make a more efficient save by being balanced in a solid ready position. Properly balanced and prepared for the save you will next have to make, you are in a better position to keep the ball out of the net. Even if you are not on the best angle, you are still ready in your stance; giving you are better chance to make the save, than if you were trying to move onto the angle and still moving when the shot was released. Notice how the goalkeeper in this picture is in a good position, with a balanced stance, to make a save immediately, if he is forced into action. – If it is a point shot you are facing, then get into a good position and be well balanced before the shot. However, if it is a passing play, then you will need to be agile to get across in time. In essence, you don’t want to over step: still moving means that you are not ready for the save, so by being precise and conservative with your movements, you are more capable of shot stopping by simply arriving on time as it were to meet the shot – being in the right place at the right time for a successful save. Ultimately, you need to pre-set for shots when you are seeing straight shots at you. If you are faced with a 2 on 0, then you need to react to get across to block the ball on the pass. You need to consciously think about getting set, so that you are always moving with the play; ready to get into the correct position against the incoming shot. Try to play a smaller D so that you have less to do; moving less and being able to get on the angle quicker. Maintain a balanced ready stance all the time, so that your task is made easier by being already prepared for the save. I’m both a veteran keeper and an official. 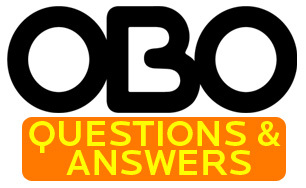 I’ve got a question about your experiences with penalty strokes. Over the course of the past few years I’ve noticed a trend where once both players are in place, the stroker is allowed to take the stroke at any time– no whistle. This has happened frequently enough that I’ve started asking game, tournament and event organizers to clarify the stroke procedures with me (and other officials) prior to play. I’ve never seen a modification to the FIH rules for any tournament, event or game that modifies this part of the stroke procedure and yet it seems to be a common misconception. As an official, I make sure to handle the stroke properly but as a keeper, I’m obviously limited in what I can do in a game. I’ve asked my captain to ask officials and we’ve even appealed a goal called in the situation but it just stinks not to be able to focus on the stroke alone. Does anyone have similar experiences, can you point me towards some explanation of this trend– am I missing some publication?–, or thoughts on how best to handle it? The Kookaburras have won the three test series against Korea in Hobart despite finishing with a 2-1 loss in the final game on Sunday. After 5-1 and 3-2 victories in the opening two games, Korea responded well to end their tour on a positive note. They are certainly a very good side and will be a force to be reckoned with at the World Cup at the end of the month. As I mentioned in my previous post, there was a large Australian squad taken to Tasmania that included three keepers. I played the first half in game 1 and the second half in game 2, fortunately recording two clean sheets in my time on the field. Generally as a keeper in the Aussie team you only get a handful of touches each game due to the quality of the defence in front of you, so it makes every involvement you do have in the match all the more important. My favourite for the week was a save from a Korean deflection inside the final two minutes of the close win in game two. Fellow GK’s Bazeley and Burgers shared the net in game three and we all now face a week of training and intra-squad matches before we find out which two of us will be heading to India for the World Cup. One habit that I like to follow whenever possible prior to a match is to spend some time on the field before the warm-up just visualising the game from my position. This is not always an option, particularly when playing a club game or during a tournament when the turf is being used for another game immediately prior to playing myself. 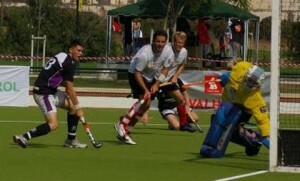 However during a test series against another nation there is often time available to spend taking in some of the relevant cues from the goal, such as the impact of the sun’s glare or any potentially distracting obstacles in the background. This is particularly useful when you are playing at an unfamiliar venue, and I was caught in the act here during the Korean series in the picture I have included. 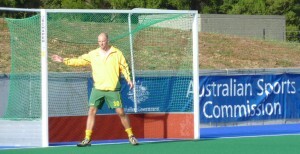 The Kookaburras have played their first test for 2010 in Hobart, recording a 5-1 win over Korea in match one of three this week. Coach Ric Charlesworth brought a squad of 25 players to Tasmania for the series as he looks to finalise the 18 that will represent Australia at the World Cup in India next month. 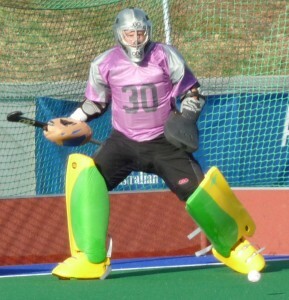 The group includes all three keepers who represented the Kookaburras in 2009, with the intention being to share the load against Korea by playing two halves each over the three games. I was in the net for the opening whistle yesterday and was happy that we went into the half time break 1-0 up after Des Abbott put one away for Australia after 17 minutes. The crowd in Hobart was fantastic and it was a buzz as always to represent my country, but particularly enjoyable given the great reception we received in Tasmania. 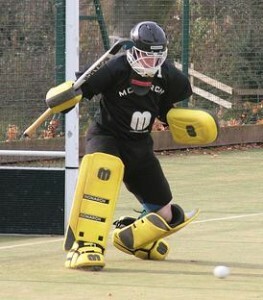 It was my first game in my new Green and Gold pads that OBO made up for me, and so far so good – no goals conceded! Nathan Burgers took over in the second half and in the end we were comfortable winners, although given Korea’s habit in the recent Champions Trophy of coming back from big deficits to salvage results we were wary of their talent right until the final whistle. Games two and three will be played over the weekend, I’ll let you know how we go! What you use to clean your mask will depend on how dirty it’s gotten. If you’re cleaning it fairly regularly you can wash and rinse with warm water and an anti-bacterial soap. If it’s pretty grungy I would recommend rinsing the mask thoroughly, then scrubbing it with a gentle plastic brush with something like Fantastic or Formula 409, followed by rinsing and washing again with a an anti-bacterial soap. It’s important that you dry the mask after washing to keep the hardware from rusting and any mold developing. Author adminPosted on February 2, 2010 Categories OBO Online ExpertTags cleaning, HelmetLeave a comment on What should I use to clean the inside of my mask?